Twitter is a free social networking service that allows its users to send and read other users’ updates. The messages are known as “tweets.” The text-based posts are short and can only use up to 140 characters. Twitter is easy to use and a quick way to get a message or idea out to many people. Over the past several months, traffic to Twitter has exploded. Worldwide visitors to Twitter approached 10 million in February, up an impressive 700+% vs. year ago. The past two months alone have seen worldwide visitors climb by more than 5 million visitors. U.S. traffic growth has been just as dramatic, with Twitter reaching 4 million visitors in February, up more than 1,000% from a year ago. Who is largely behind the huge increase? Research has found that people aged between 45 and 54 are 36% more likely than other age groups to use Twitter, making them the highest rated age group. On April 10, 2009, it was reported by many sources that both Google and Microsoft are courting Twitter. The talks seem to be centered on a deal to exclusively deliver search or other similar services to Twitter. Earlier this month, media reports said the Google was in talks to buy Twitter. The figures of $250 million to $1 billion have been rumored. Why should we be discussing Twitter on a Clay Aiken Board? Well, Twitter is another great place to promote Clay and share his music. It lets you interact with the public while introducing Clay and his music in a subtle and quick way. But, just like in any social situation, a participant needs to be careful. There is a young man on Twitter who goes by the name of ……well, he uses the name of a tall, talented singer and actor from North Carolina. This young man has been trying to get attention on the web for a long time. He started a blog a few months ago and copied each blog from this site and many other sites. He never gave credit and tried to make the reader believe the articles were his. Now, he is on Twitter, responding as if he is Clay. There is no law or rule to keep him from doing this. However, I think most people realize that Clay will not be answering our posts personally unless he announces it on his fan club board. Do you Twitter? I haven’t started yet, but I think its time to check it out. Very interesting blog re Twitter. Another bogus Clay Aiken twitter account was just set up. Never been there…don’t think I’m interested. Seems a little too stalkerish to me. (probably no such word). 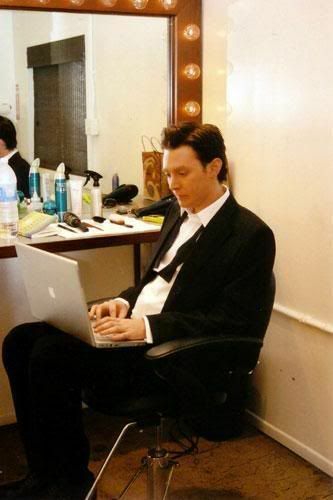 There are fake accounts all over the internet for Clay Aiken. It is too bad that some people are gullible enough to think they are talking to Clay, when it is really an imposter. If you really want a chance to talk to Clay, join the Fan Club. I think Twitter can be fun, but also feels a little too stalker-ish (or whatever the person up there said). Thanks for the article! I think the Twitter thing is a little crazy and I don’t have an interest in it. But, thanks for the article anyway! Error: Error validating access token: Session has expired on Tuesday, 21-Aug-18 16:13:01 PDT. The current time is Tuesday, 23-Apr-19 00:29:12 PDT.